GWL Realty Advisors Inc., OPTrust, and Investors Group Inc. are in talks to buy a tower in Toronto’s financial district from Oxford Properties Group Inc and Canada Pension Plan Investment Board, according to people familiar with the matter. The three companies have partnered to purchase the Dynamic Funds Tower for about $475 million, said the people, who asked not to be identified because the matter is private. The deal is not finalized and may not go through. Representatives for GWL, a unit of Great-West Lifeco Inc., OPTrust, which manages pensions of Ontario public servants, Investors Group, a unit of IGM Financial Inc., declined to comment. Canada Pension Plan and Oxford, the real estate unit of Canadian pension fund OMERS, also declined to comment. 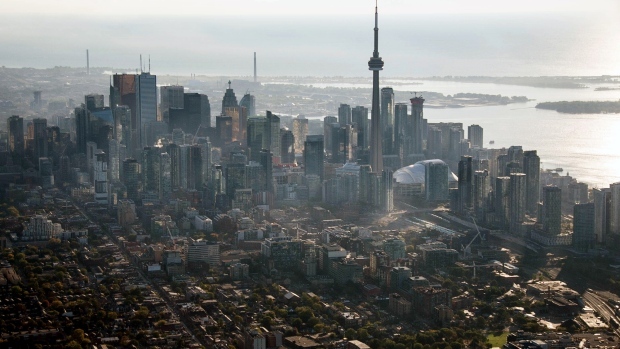 Canadian pension funds and other investment groups have been buying up commercial real estate for its steady and robust yield amid solid economic growth in Toronto, where the financial and tech sector is booming. Companies such as Accenture Plc, Shopify Inc. and Uber Technologies Inc. have announced expansions that would bring thousands of new workers into the region in coming years. Toronto-based OPTrust is headquartered in the Dynamic Funds Tower, located at the corner of Yonge and Adelaide Streets. Tenants in the 30-floor building include Fiera Capital Corp., Scotiabank and Dundee Corp. The tower was built in 1991.